A “major update” for Facebook for Windows Phone was announced by Microsoft Monday, and the updated application includes support for the recently released Facebook Messenger for Windows Phone. The update also included support for more languages, the ability to upload videos taken with Windows Phone devices directly into the app and feature for Windows Phone 8.1 users. Today, Facebook for Windows Phone is receiving a major update that brings an updated design and new features that were previously available in beta. Along with the overhauled user experience and improved app performance, Facebook for Windows Phone now supports more languages and has the ability for you to upload videos taken with your Windows Phone device directly to from the app. 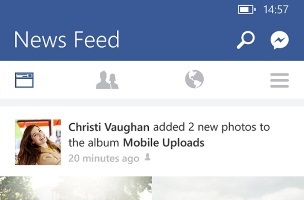 It also supports integration with Facebook Messenger for Windows Phone. And for devices with Windows Phone 8.1, it will now connect directly with the People Hub. 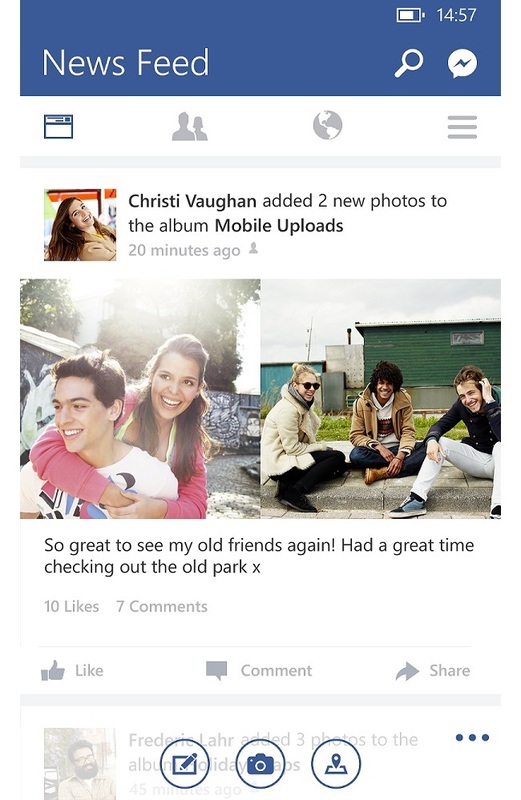 In Windows Phone 8.1, Facebook contacts, events and photo albums are now powered by the Facebook for Windows Phone app. If you have the app, you should receive the update shortly. If you don’t have it, download it here from the Windows Phone Store. Windows Phone users: Have you updated your apps yet? What do you think?